All Oak Glen homes currently listed for sale in Oak Glen as of 04/25/2019 are shown below. You can change the search criteria at any time by pressing the 'Change Search' button below. If you have any questions or you would like more information about any Oak Glen homes for sale or other Oak Glen real estate, please contact us and one of our knowledgeable Oak Glen REALTORS® would be pleased to assist you. "Magnificent Mountaintop Estate & Business Venture. 865 acres! Rare offering. Mountain Chalet+buffalo ranch+five star steak house+saloon. At 4,000 to 9,000 feet, Eagle Crest is the highest elevation, private compound in SoCal. 16,000sq. ft. rustic chic chalet features 6 bay garage, carport, elevator, 17 seat theater, gym, wine cellar, guest apartment, private water source and solar power system. Exterior features wraparound deck, outdoor kitchen, ponds, waterfalls, 120' stream plus barns, caretaker's home, stocked fishing pond and boundless backcountry teeming with wildlife, Redwoods, Sequoias and a 5.5 mile trail to the peak of Little San Gorgonio. Also 0.75-acre event space and a 2.25-acre parcel of land in Oak Glen. Unobstructed views of Little San Gorgonio, Mount San Jacinto, San Gabriel Mtns, Salton Sea and beyond to Catalina. Enjoy four seasons an hour from LA, Palm Springs, Big Bear and Lake Arrowhead." "This beautiful custom, private gated home is nestled in the hills of the quaint apple community of Oak Glen. The traditional covered entrance, timber beams and natural materials create the surroundings for fine mountain living. Attention to detail and design is evident in the open beam ceilings, the rotundas and a layout that provides for authentic mountain entertaining. The living space is massive with several entertainment areas and a large wet bar. The kitchen boasts commercial grade appliances, double dishwashers Sub Zero Frig, walk-in pantry and an indoor, stainless steel BBQ. The office is impressive with exposed beams, built-ins and a closet for an easy additional bedroom. The master suite is spacious with a full sitting area, wet bar and luxurious spa style bath. The downstairs junior suite with separate entrance is spacious and comfortable. The craftsmanship and details are seen in the moldings, stone work, hand trawled finished walls, the hickory flooring, the beautiful staircase and fixtures. The attached, 4 car garage is finished with a pit, air, water, drains, cabinets, plenty of electrical and Mahogany garage doors. A beautiful deck made of Pau lope wood is shaded by one of many of the large Oak Trees. Detached 1440 sf garage/shop, several out buildings, a high producing well, generator, graded roads throughout the property and a setting that boasts Blue Spruce, Dogwoods, Japanese Maple and many other trees. The views are spectacular and the community inviting." 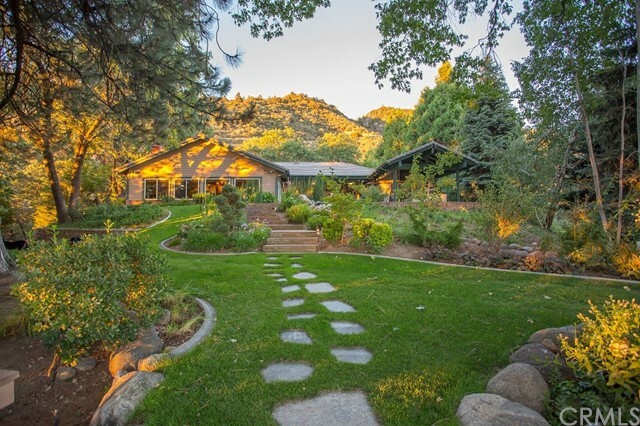 "MOUNTAIN RETREAT / PRIVATE COMPOUND WITH ULTIMATE PRIVACY, 22.41 MULTI-USE ACRES ADJACENT TO SAN BERNARDINO NATIONAL FOREST, GATE GUARDED, SPECTACULAR 50 MILE VIEWS OF RIVERSIDE AND SAN BERNARDINO COUNTIES! THIS PROPERTY PRICED TO SELL TODAY AT 50% OF IMPROVEMENT COST!!! THIS IS A ONE-OF-A-KIND MOUNTAIN HIDEAWAY, IN THE PINES BEHIND SECURITY GATES FOR ULTIMATE PRIVACY, PERFECT FOR CORPORATE OR SPIRITUAL RETREATS, WEDDINGS, PARTIES, CUSTOM LIVING, HOBBYIST, ENTHUSIAST, CONTRACTOR, SECLUSION, OUTWARD BOUND .MUST SEE, BREATHTAKING VIEWS AND NATURE. IMPROVEMENTS INCLUDE: 4500 SQ.FT. CUSTOM HOME WITH HUGE 4 CAR GARAGE, LARGE POND STOCKED WITH FISH, KOI POND AND STREAM, COVERED PATIO AND DECKS FOR ENTERTAINING, BUILT IN BBQ AND DEEP PIT BBQ / 45 X 60 SHOP BUILDING WITH GUEST FACILITIES, TROPHY ROOM, DRIVE IN AND DRIVE OUT ROLL UP DOORS / 35 X 50 SHOP BUILDING FOR EQUIPMENT WITH DRIVE IN AND DRIVE OUT ROLL-UP DOORS / COMPLETE HORSE FACILITIES INCLUDING PADDOCKS, LOAFING SHEDS, STALLS WITH TURN-OUTS, APPLE ORCHARD, MAJESTIC OAK TREES AND PINES." "HUGE PRICE REDUCTION !! THIS ONE IS A MUST SEE! Peaceful Mountain Lifestyle Close to the City! 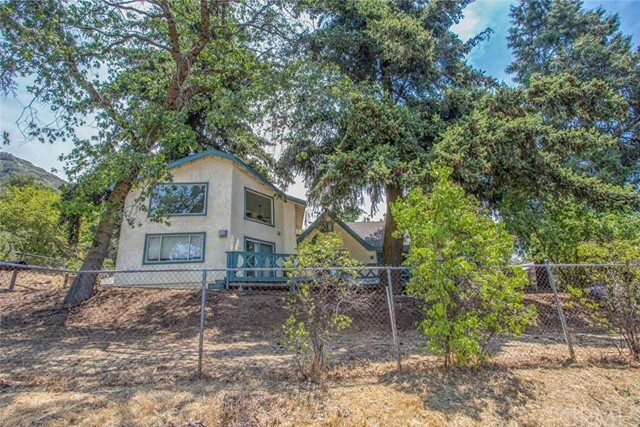 Rooms, Views, Storage and So Much More .Located on a Private Road in the heart of the Oak Glen apple country. This home sits just above the Yuciapa and Beaumont cities giving you Freeway Access and all the Shopping Selection you need with the Peacefulness and Privacy of the Mountain Lifestyle. This stunning home was Made For Entertaining. All 3 floors have ample room and are perfectly laid out to accommodate any size family or party. The huge Basement area is complete with a Wine Cellar, Sauna and restroom. The main level is exquisite with 2 Fire Places, an Open Kitchen and a full bed and bathroom. The third floor features 4 additional bedrooms, all with Walk In Closets and in-room Full Bathrooms. Last, but certainly not least, is the Master which features it s own fire place, Extra Large Closet, Dual Sinks and Vanity Area. This home has a wonderfully inviting feel. Come see this beauty and relax for a moment in the fresh mountain air. You really have to see it for yourself !" "Oak Glen Charm. 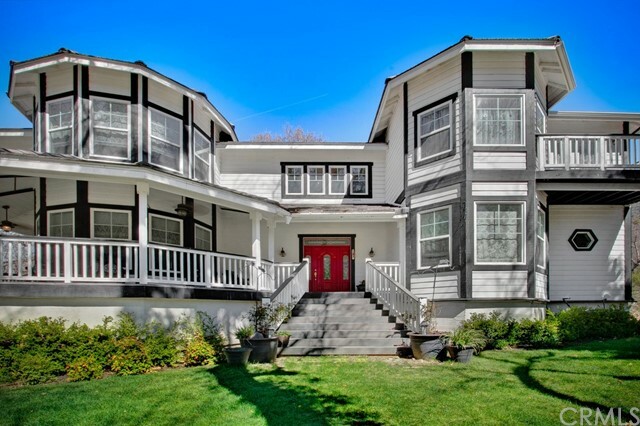 Come enjoy this very special 1940's home with upgrades and updates. Experience the 4-seasons yet just minutes to the Inland Empire or the I-10 going towards the Palm Springs Desert. This unique home has character and charm thorough out and area for your own Apple Orchard, horses, organic garden and much more on this 87,120-sq. ft. lot. Knotty Pine living room and dining area while enjoying the Lodi Wood Stove, and Country kitchen that opens to your dining area. Fabulous Great room and Master bedroom loft with lovely views from all the windows, there is a separate guest house ready for your personal touches, a detached garage and enjoy the fabulous well water, yes, your own well. Lovely views surround you with this one-of-a-kind property and walking distant to the Oak Glen Village. Enjoy your coffee in the morning from your wrap around deck or take a break and walk to the Village and enjoy coffee with your local neighbors. Don't miss this home and the relaxed life style."